Looking to upgrade your beginner compound or recurve bow to something a little bit more powerful and dependable, with competition level accuracy to boot? Then look no further than the PSE Surge. Designed and engineered from the ground up to produce the super accurate and speedy shots you’re after, this is a bow that is perfect for those that hunt as well as those that compete. 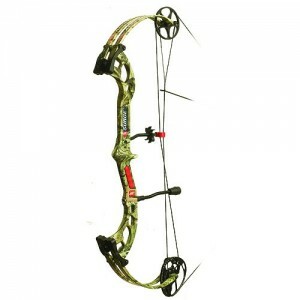 Super light, incredibly smooth, and with the kind of durability you need out of a premier level bow. This bow sends arrows downrange with incredible speed, packing a powerful punch without sacrificing any accuracy along the way. And because the cam and axle system is so quiet you’ll be able to send multiple arrows to the target (or to multiple targets) without you every having to worry about spooking the prey. This bow is incredibly light, incredibly strong, and capable of top speeds – which translate to real power when the arrow reaches its target. You’ll have no trouble bringing this compound bow up and delivering multiple arrows on target, thanks to the smooth draw and stable cam system. Since this bow is so lightweight, and since it is to stable, you shouldn’t have any trouble whatsoever packing this bow into the bush and taking down game – even if you’re fatigued from hiking all day. The engineering that goes into this bow (combined with the premium construction materials) guarantees that you’ll be able to reliably use the bow for years and years to come. This isn’t the kind of starter bow you’ll feel like you’ve outgrown in a year or two, and it isn’t some cheap or chintzy bow that will fall apart the third or fourth time you take it out for some practice. With arrow speeds of up to 320 FPS, we’re talking about a compound bow that can be used in tournament and competition settings as well as one that can be effectively used while out hunting. The versatility that this bow delivers is really something special, and it’s a big part of what makes the PSE Surge such an attractive option to archers out there today. The price tag on this PSE Surge bow isn’t quite as inexpensive as many would believe it could or should be, and that’s a bit of a problem for those looking to keep their new bow purchase limited to the budget options only. Sure, the price tag isn’t outlandish for everything that this compound bow brings to the table – but it definitely isn’t the cheapest option out there, either. You do get what you pay for with the PSE Surge, however, and that means that if you’re looking for a bow to last 5, 10, or even 15 years (all while leverage top tier technology and upgraded components), the overall cost of ownership with the PSE Surge isn’t that outlandish. Customer reviews are very favorable, with the majority of folks really happy with the lightweight build and top FPS power that the PSE Surge offers. Sure, there are other bows out there that might have more name recognition, but that doesn’t necessarily mean that they are better than this compound. The odds are pretty good that you’ll be writing your own PSE Surge positive review online shortly after you spend a little bit of time with this one! …then the PSE Surge is the bow for you! https://allaboutarchery.org/ is a participant in the Amazon Services LLC Associates Program, an affiliate advertising program designed to provide a means for sites to earn advertising fees by advertising and linking to amazon.com. Amazon, the Amazon logo, AmazonSupply, and the AmazonSupply logo are trademarks of Amazon.com, Inc. or its affiliates. Copyright 2016 by All About Archery.